Having your car towed for the first time can be intimidating. One minute you’re on your way to work or the store, the next you’re stranded with a completely dead battery, mechanical failure, or worse — you’ve been involved in an accident. At some point, most people need to call a car towing service for a tow or general roadside assistance. If you find yourself in the stressful position of needing to call a towing company in Las Vegas, here’s what you should know and expect. When you find yourself in a difficult situation and need to have your car towed, make sure you choose a reputable and trusted towing service. While you may not have much time for research, it’s still important to choose a company you can trust. You can still get cheap towing in Las Vegas while choosing a towing company that’s honest and takes the necessary precautions before lifting your vehicle. If you choose the first or cheapest tow company you find, you may be setting yourself up for an unpleasant experience. If your car has broken down for some reason, it’s important to put safety first. Don’t get out of your car unless it’s necessary, such as smoke coming from the engine or you are stopped in a dangerous spot. If you do need to get out of the car, get out on the opposite side of traffic and do not remain in front of or behind your car. If it’s safe to do so, remain in your car with your seatbelt on until the towing service in Las Vegas arrives. The good news is you shouldn’t be waiting long: fast towing in Las Vegas means you can be either on the road or getting a tow to the shop within 30 minutes. Be wary of anyone who approaches you if they aren’t with the car towing service. Never accept a lift from a stranger. While most will be good Samaritans, you never know anyone’s intentions. As an extra form of precaution, ask the dispatcher with the tow truck company in Las Vegas to give you the driver’s name and license plate number for verification. To help your tow truck driver find you, be as precise as possible about your location with the dispatcher. If you can, use your phone to provide your GPS coordinates. You should also describe your situation, such as whether you are in a parking lot, on the shoulder of the highway, or stuck in a tight spot. This will help the tow truck company choose the right truck to send for you. While you’re waiting, gather up any important paperwork in your car like your insurance information, registration, and personal items. You don’t want to leave these behind or in the car if your car is going to be towed. 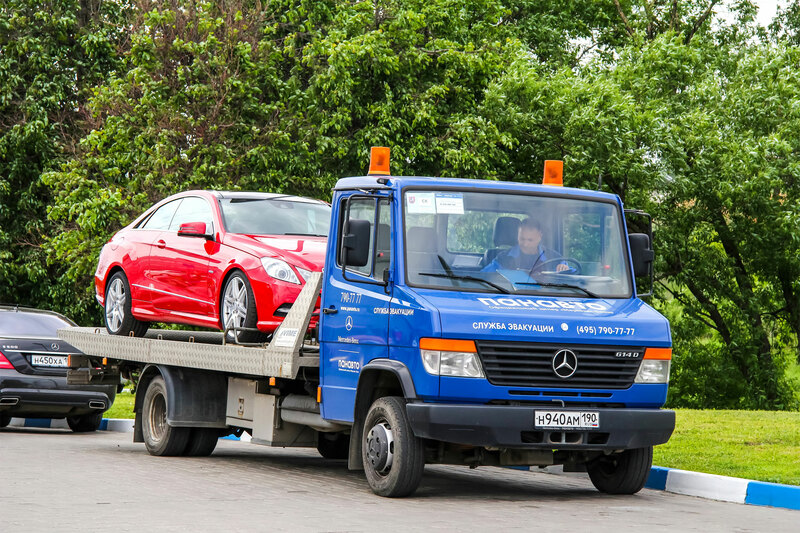 When the car towing service arrives, you will probably need to sign some basic paperwork, give instructions, and take a few steps to get your car ready. You will probably need to put your car in neutral while the tow truck driver attaches a hooked chain or tow rope. Make sure you don’t leave your emergency brake on when your car is being towed. A vehicle towed on two wheels with the E-brake on can cause damage. If your windows were rolled down while you were waiting for the tow truck, be sure you roll them up before the tow to prevent dust or rain from getting inside. You may also want to take a few photos of your car before it’s towed to show the car’s condition before the tow and for insurance purposes if you were involved in an accident. Once your car is hooked up, you can either ride in the cab of the truck with the driver or wait for a ride.